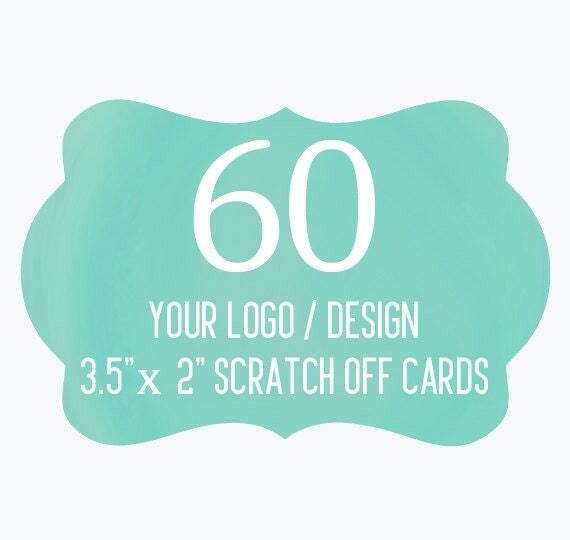 60 Custom Promotional Scratch Off Cards. Each ticket measures approximately 2" x 3.5"
Scratch offs provide a fun and unique way to promote your shop or business! Keep customers coming back with these promotional incentives. - A Percentage off their next purchase. - Buy one get one free. - Free gift with next purchase. Your purchase of 60 cards will come with 3 different variations. Scratch off cards are professionally printed on heavy high quality glossy card stock. Scratch off area will be 1" round so please allow space for that in your design. These worked great for our event! So in love with my custom order! Amazing quality and fast turn around time. Great quality product!! Very fast turn around time & very fast shipment as well. I will definitely be purchasing from them again! !